Can't Rip DVD with Handbrake Problem Solved. Rip Any Protected DVD with Best Handbrake Alternative on Windows (10) or Mac. Why Handbrake can't rip The Revenant movie DVD or any other copy-protected DVD? When you can't rip DVD with Handbrake, what can you do? Check possible reasons below, and find solutions to fix Handbrake can't rip DVD problem once for all. A stellar Handbrake alternative will also be introduced. Once-for-all solution to fix can't rip DVD with Handbrake problem, by supporting ripping any home-made or copy-protected DVD (incl. latest Disney DVD) to MP4, AVI, WMV, MOV, iPhone 7/7 Plus/6S, etc. fast and smoothly, without quality loss. 100% clean and safe. 1. Handbrake can't rip copy-protected DVD alone because it does not support DVD decryption, so it needs third-party software like VLC to remove copy protections from commercial DVDs first. 2. DRM DVD is always encrypted with multiple random titles and Handbrake can't tell which one is correct. When it scans the whole DVD disc, it may select the wrong title or crash in the middle. You may also need a smarter DVD ripping tool to help auto check the right DVD main title to rip. 4. Another disadvantage of Handbrake is it can't rip DVD to other popular video formats other than MKV and MP4 (M4V) and its output video codecs are limited to H.264, H.265 and MPEG4. To steer by all the above can't rip DVD with Handbrake troubles, it's time to try some possible alternatives. Below is going to introduce one of best Handbrake alternatives in market today named WinX DVD Ripper Platinum. Continue to see what it can amaze you. WinX DVD Ripper Platinum, known for fast, clean, smooth and extremely user-friendly, is viewed as one of the best DVD rippers for Windows 10/8/7/Vista/XP. Let's see what this most powerful Handbrake alternative can do to fix unable to rip DVD with Handbrake problem for good. 1. Easily rip (protected) DVD to MP4, AVI, WMV, MOV H.264, MPEG, FLV, etc. as well as iPhone 7/7 Plus, 6S/6S Plus, iPhone SE/5S, iPad Pro/Air 3/2, Android Samsung Galaxy S7/S7 Edge/Note 7 and 350+ preset profiles, with ease without losing quality. 2. Support removing all DVD copy-protections including DVD CSS, region code, RCE, Sony ArccOS, UOPs, Disney X-project DRM, etc., and constantly update to support newest DVDs. 3. 4 DVD backup modes are provided, including 1:1 ratio copy DVD to ISO Image file/DVD folder, copy DVD main title or full title to a single MPEG2 file with 5 minutes. 4. DVD ripping speed is the fastest thanks to its multi-core CPU (utmost 8) and Hyper-threading tech, and an hour and a half DVD movie can be ripped in about 10 minutes (also depend on computer hardware). 5. This top Handbrake alternative also provides many video editing options like trimming, cropping, expanding, adding subtitles, etc. Setting video/audio parameters like changing video resolution, frame rate, bitrate, sample rate, etc. are also at hand. 6. 100% clean and safe. No ads, malware or virus at all. Smooth and stable. To solve can't rip DVD with Handbrake issue, first of all, you can free download and install WinX DVD Ripper Platinum on your Windows 10/8/7, etc. or free download Handbrake alternative for Mac. 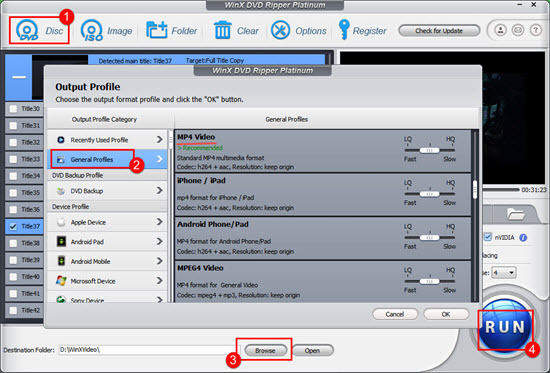 Then follow the detailed guide below to rip any copy-protected DVD to hard drive as MP4, AVI, MOV, etc. Step 1: Load the DVD movie info. Insert DVD disc to the DVD-ROM. Launch the best Handbrake alternative program and click "DVD Disc" button on the top-left. While most users can't rip copy-protected DVD with Handbrake, this smart DVD ripper can auto detect the right DVD main title for you. Step 2: Choose the output. Select the output video format for the ripping DVD movie in the pop-up Output Profile window. Numerous video/audio formats and 350+ device profiles including iPhone 7/7 Plus are provided. Step 3: Start ripping DVD to video/device. Click "Browse" to set a destination folder to store the ripped DVD movie video, and hit "RUN" button to start converting DVD to digital copy at a superfast speed with best Handbrake alternative. Best DVD ripper for Windows 10/8/7, etc. enables users to rip any copy-protected DVD to MP4, AVI, WMV, H.264, MOV, iPhone 7/7 Plus/6S/6S Plus, Samsung Galaxy S7/S7 Edge, etc. with highest quality at fastest speed.